The name of the program is connected to a moment, when it was published for the first time. This moment was in 31 December 1999. It is actually a pun of the ending of world as predicted for the year 2000 The name is the jocose realization of the prediction. 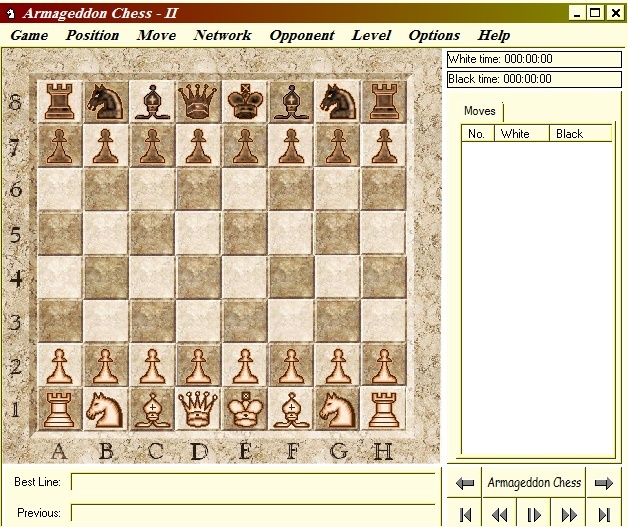 Armageddon is a chess program with his own GUI, but it could be used with Winboard GUI. It could communicate with other programs by RS232 port. One can play with friends on a LAN network too. It can utilize a massive endgame database library. Armageddon has some chessboards, figures and clocks. You can play games with any time control (also with the Fisher's clock). Armageddon can also create chess diagrams for your web site.